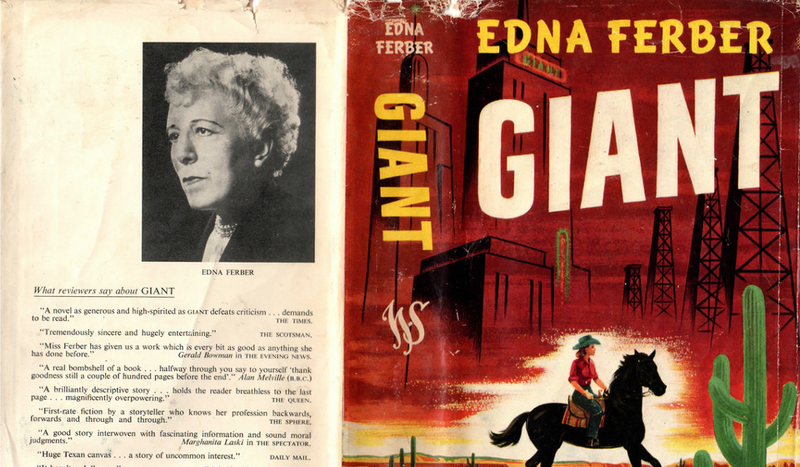 Click here to read last week's Bygone Bestseller: Betty MacDonald's THE EGG AND I.
Edna Ferber’s GIANT has been a contender for recognition as “THE Texas novel” since its 1952 publication, but the excellent movie adaptation from 1956 is even better known. The movie itself will be the subject of a new book out in April – GIANT: ELIZABETH TAYLOR, ROCK HUDSON, JAMES DEAN, EDNA FERBER, AND THE MAKING OF A LEGENDARY AMERICAN FILM. Interabang will host author Don Graham on Thursday, April 26th at 7pm to discuss his book, making this a great time to pick up the original novel. GIANT was a late-career hit in the life of its author. Before it was published, Ferber had already earned a place at the celebrated Algonquin “round table” of wits, won the Pulitzer for her novel SO BIG, written the Broadway hits STAGE DOOR and DINNER AT EIGHT, and inspired the even- bigger Broadway hit SHOW BOAT. That classic musical, based on another of her books, was devoted to a place and several generations of its people, just like GIANT. In her Texas novel, Ferber cooks up a story involving a cattle baron, a society girl from Virginia, and an upstart ranch hand who strikes oil. Notably, the book includes significant Hispanic characters, and the author’s indignation about the prejudice they encounter still jumps off the page. She is unerring about so many details (of fashion, of attitude, of gesture) that her occasional mistakes seem like howlers – calling the university Texas U, for example. No matter; you won’t stop reading. Check back next week for another Bygone Bestseller from Kyle!